Getting fuel to remote operating bases is a big problem for the U.S. military. In 2008, during the height of combat in Iraq, the Government Accountability Office estimated that more than 900,000 gallons of fuel went to bases for basic power needs like lighting and refrigeration (on top of the 6.7 million gallons the military burned that year in jets and ground vehicles.) The U.S. military’s Strategic Capabilities Office has put out a request for information about small nuclear reactors that could deploy to the sorts of hillside forward bases U.S. troops set up in places like Afghanistan. According to the request for “Project Dilithium,” the reactor should fit on a truck and a C-17 aircraft and generate from one to 10 megawatts of electric power for three years without refueling. Soldiers have to be able to stand it up in 72 hours and take it down in a week. It’s got to be meltdown-proof. The office is looking to fund three different prototype designs and will then select a winner from among them. The idea of deployable nuclear reactors only seems outlandish. In fact, the research has a long history in the military. In 1954, the Army launched the Nuclear Power Program, under its Corps of Engineers developed a variety of nuclear reactor cores of different sizes. They were deployed to places like Fort Greely, Alaska; Sundance, Wyoming; Camp Century, Greenland; even a barge in Lake Gatun in the Panama Canal. All functioned well with no safety issues. But the military lost interest in the projects before too long. Oil was cheap and there was already a supply and logistics infrastructure to deliver it. The idea re-emerged in the 2000s, when hauling fuel to remote bases in Afghanistan proved costly — and perilous to convoy crews and frontline troops alike. In 2011, the Defense Advanced Research Projects Agency, or DARPA, picked Army Col. Paul Roege to manage a six-year, $150 million program to develop small, modular, nuclear reactors for forward bases. Roege’s first step: figure out just how much electricity the troops needed. But then came sequestration, and tough financial choices. Then-DARPA Director Regina Dugan faced a the prospect of cutting money out of several programs or going after select big ones. The nascent program to develop small nuclear reactors was shoved overboard. It was only recently that the military returned to the subject. 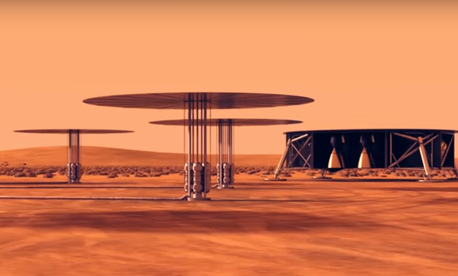 In 2016, a Defense Science Board Study concluded, “There is an opportunity for exploration of the use of nuclear energy applications at forward and remote operating bases and expeditionary forces.” The board concluded that the best approach for these super small reactors was radioisotope thermoelectric generators. They work simply: as the reactor fuel — either plutonium-238 or strontium-90 — decays, it slowly but surely releasing lots of heat, which is converted by thermocouples into electricity. NASA uses these generators to to power satellites and other spacecraft; the Soviets once used them to power Arctic lighthouses.The study proposes Schriever Air Force Base in Colorado and the Clear Air Force Station in Alaska as the most likely sites to host the reactors at first. If it can work, it beats the alternative, hundreds of thousands of gallons of fuel trucked over dangerous enemy terrain. It seems there are fewer people dismissing the idea, now.